The band, who reformed in the summer for a series of shows after splitting a decade and a half earlier, will top the bill on Friday June 14. Organisers say it will be the only UK festival appearance of 2013 for the Roses, whose hits include Fool's Gold and She Bangs The Drum. The group - fronted by Ian Brown - played triumphant shows in Manchester's Heaton Park in June and a number of European festivals, including V in August. They will be making their Isle Of Wight debut, and further headline names are expected to be revealed later this week. 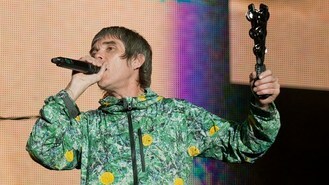 Festival promoter John Giddings said: "When you talk about the soundtrack of our lives, the Stone Roses are embedded in it. "I am so proud to get them to our island - they will kick the weekend off with a bang." This year artists such Bruce Springsteen, Pearl Jam, Tom Petty, Noel Gallagher and Jessie J were among the big-name performers. Tickets go on sale generally on Wednesday at 9am with further details about the event, which features three stages, at www.isleofwightfestival.com.